I've read and thoroughly enjoyed many of Val McDermid's books in recent years, but I'd yet to dip into her sporadic series starring Detective Chief Inspector Karen Pirie (four books since 2003). When I finally did, with this latest instalment, what a treat awaited me! I was effectively reading it as a standalone, but I was aware DCI Pirie had featured in previous books, so there was a 'past history' for regular Pirie readers that I didn't know. Perhaps such readers may get even more from OUT OF BOUNDS, but I found it a really terrific, engaging read and never felt short-changed coming into the series out of order. McDermid does a great job giving the characters, new and continuing, some nice depth and not appearing to rely on past reader knowledge to do any of the heavy lifting. In OUT OF BOUNDS, new events spark Pirie to take another look at a couple of quite different cold case crimes. There's a vicious unsolved murder from more than twenty years ago, which is now back on the radar thanks to teenage thief Ross Garvie whose DNA pings the cold case in the database. Garvie hadn't even been born when the cold case crime was committed, but the technology says that he's a link to the culprit. Then there's the apparent suicide of the troubled son of Carolyn Abbott, a victim of the bombing of a Cessna aeroplane in the mid 1990s. A bombing attributed to the IRA. Pirie is leaping on new leads and new technology while looking to investigate very old crimes. I really enjoyed OUT OF BOUNDS, on several fronts. 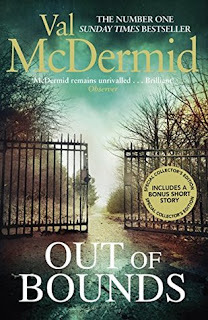 Unlike some of McDermid's other popular and acclaimed titles, it's a decidedly Scottish book, and McDermid brings her native setting to vivid life with a strong sense of place (and the people of that place). Pirie is an engaging character, formidable and flawed, who has an underlying heroism even as she stumbles at times. She feels very 'real' rather than a crime-solving superhero. Her interactions with her offsider DC Jason 'the Mint' Murray provide some nice 'lighter' balance between the dark deeds of the novel. And that's the overall feel I was left with while reading and after finishing OUT OF BOUNDS. It's an incredibly well-balanced crime novel, strong across the board rather than a particular aspect hogging all the attention (eg a crazy twist, an unusual set-up, or an unlikely setting). Pirie is a great character, and the others in the 'cast' are well-fleshed out too. There's a page-turning drive to the storyline, with plenty of intrigue and interest on different levels. There's a great sense of the Scottishness of its setting, rather than the event occurring and the characters living in just 'Anywheretown, UK'. A cracking great read from a true master of the genre.